Simple, secure, integral web interface GUI configuration tool. Authentication logging, configuration changes and system events. Email notifications of log, event, authorization, power and configuration messages. Automatic firmware updates via FTP server. Strong password support and pre-login banner. Ability to ping an IP address to see if the device is responding. Grouping of outlets across multiple CDUs. SNMP: Traps based on status, changes, load, temperature and humidity. Supports 104 user accounts and 18 simultaneous logins with a dedicated SNMP connection. Current (Amps), Voltage (Volts), Power (Watts), Apparent Power (VA), Power Factor, Accumulated Energy (kWh), Neutral Current: Measures neutral current. Web Interface, RS-232 access, 10/100 Base-T Ethernet, SMTP/Email, Telnet, SSH, SSLv3/TLSv1, SNMPv2, TACACS+, LDAP, LDAPS. RADIUS, DHCP, Syslog. Intelligent CDUs enable network access to remotely configure access, outlets, alarms, thresholds, and more. Control outlets on Switched CDUs (ON, OFF, REBOOT). Group Outlets based on: device, group of devices, cabinet (single IP address supports master & expansion CDU), or individual CDU. No additional IP address needed to obtain temperature and humidity readings with optional temp & humidity probes. The Smart CDU products provide reliable power distribution coupled with remote power and environmental monitoring. Use the network interface to view power, temperature and humidity levels via Web browser, and receive SNMP-based and email alerts when conditions exceed defined thresholds. Smart CDUs with PIPS (Per Inlet Power Sensing) combine all of the features of a Smart CDU with the ability to provide power monitoring per inlet/infeed. Power information per infeed includes current, voltage, power, apparent power, crest factor, reactance, power factor and accumulated energy. This information replaces branch circuit monitoring devices typically installed in the power distribution panel or remote power panel (RPP) with higher accuracy and lower cost monitoring of each circuit attached to the CDU. 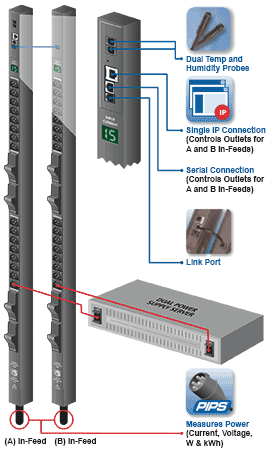 The Switched CDU products provide the capability to securely monitor and control cabinet power via a network for a data center or remote branch office. The Switched CDUs combine networked configuration and management with power distribution and power and environmental monitoring. Reboot a single or dual power server with one command. Receive SNMP-based or email alerts when power or environmental conditions exceed thresholds. Assign access rights to user groups or individuals. Switched CDU products provide the flexibility needed for all data centers and remote sites, including power requirements for high-amperage and high-voltage, EN 60950-1:2001 Branch Circuit Protection, and SNMP traps and email alerts including current monitoring. Switched CDUs with PIPS allow the additional ability to provide power monitoring per inlet/infeed.